When you have a highly active dog, it is almost certain that pulling is one of the most common problems you face every day. Most especially, whenever you take out your dogs for walks. Things like shock collars and choke chains exist to help solve this problem. However, these materials also have the tendency to harm your dog in the long run as these type of materials put extra pressure on their bodies. For this reason, I have long opt to use no pull dog harnesses over the said materials. This type of tool stops your dog from further pulling and thus giving you less things to worry about. That said, here are my top picks for year. What are the Different Types of No Pull Harnesses? How to Find out the Size that Best Fits? 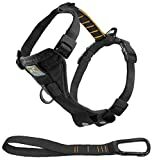 How to Put on a No-pull Harness? This pull on harness is another one of my top picks. First, I love that it comes with adjustable straps. 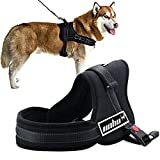 Although, you still have to know your dog’s size knowing that the straps are adjustable gives eases you of worrying especially if you are buying it online. It is also very easy to put this on and to take it off. You have the option to attach the leash to either the front or the back. Moreover, it is designed with lightweight mesh lining and a soft padding that allows for maximum comfort. It also comes with different options for the style and design. The Unho Dog Body Harness is unique in a sense that instead of having the pads attached to the straps, this one has the straps adhered to the padding. As a fully padded no pull harness, it is meant to give your dog some comfort while still allowing you to fully regulate his actions. Furthermore, to balance this structure, this harness is made out of an elastic webbing which allows for freedom when moving. However, this one is not made with adjustable straps which may be a dealbreaker for some. The Kurgo Walking No-Pull Harness is one of my top picks. It is equipped with both clip points for the back and the chest. As a result, this is one of the products that can ensure me full security for my dogs which is why I love using this during my morning walks with my dog. It also comes with a seatbelt loop which ensures your dog’s safety inside the car. What I do not like about this, however, is sometimes the carabiner attachment pops open. I love this no pull harness mostly because it comes with an easy step in feature so it is not any difficult at all to put it on. Also, there is only one buckle that has to be put across your dog’s body which makes it a whole lot easier. However, one thing I did not like so much about this is that it only comes with limited options for the sizes. But as an added plus, it comes with a really cute patterned design that makes a good fit for you if you are the fashionista type. With the options of strapping across the belly and linking chest with the front belly part, this no pull harness ensures you full security and control over your dog. This product also goes with a handle which is a good feature that allows you to control your dog’s movements. Moreover, this product also has a padded structure. However, this is a bit more expensive than the others in this list. Probably the only factor you have to take into consideration is the type of no pull harness as this pretty much covers anything. Without further ado, let us dive into it. This type best works if you are just planning to take your furry friend for a walk and not for a run, a jog or a sprint. Why is this the case? This is because since you the attachment of the harness is to the front or to be specific, across the chest, when your dog pulls the tendency is that the harness will twist the dog instead and turn him or her towards you. And since dogs have minds of their own, whenever they pull, they start to realize that they are not moving forward which is the direction they want to be. Once this happens, they soon stop pulling. If you are planning to train your dog to stop pulling on his own which I also strongly recommend you do, this can be a good start for their training. This is probably my least favorite type but it also goes with a whole lot of benefits. Back attachment harness type are good if ever there is any reason you want to replace or find an alternative for your dog collars. Back attachment harnesses takes off the pressure that can otherwise be placed or put on their necks. 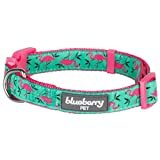 Now, these types of harnesses are the best for dogs when you are taking them out for a run or jogs. Wear a belt, clip onto it the leash and it attaches easily to the back of your dog. However, do note that as stated, for walks, this may be a bad harness type. This is because when it is attached to their back, the tendency is they are more inclined to pull. This is because when they pull from behind, they tend to go forward with this type of harness. This is not exactly a harness in the technical sense. However, this is also one of the good tools for a no-pull tool. Basically from the name itself, a head collar is wrapped around your furry friend’s head while a leash is attached to the part under his chin. What happens when you use is that when a dog pulls around, the tendency is his head will pulled right back towards you because of the harness wrapped around his head. Once his head turns to you, this stops him from walking away from you. Just take note that your dog has to take some time to fully get used to this before you use this fully. To know whether a harness is the perfect match for your dog, there are certain factors you have to check and consider. First, it has to be snug. Second, make sure the clip is hanging up across the chest. The bottomline is just make sure it does not dangle that low otherwise it will not even be of much help as it will not be able to regulate the force we call forward momentum which is basically what controls the movement of the dog. Also make sure, that the harness is not too tight as this can be suffocating for you dog and much harder for you use. To make sure you are getting the right size, what you need to do measure your dog’s chest and rib case as these largely determines the size that will best fit your dog. If you are buying online, just simply add two more inches to the measurement you get and voila, there is your ideal size. For extra small sizes, the ideal inches would be about 8 to 14. 10 to 20 inches for small sizes. For medium, go for those with 16 to 28 inches size. And for large, go for 26 to 40 inches. Since no-pull harnesses come in different types, there are also a variety of ways in which you can put them on your dogs. Usually, you can put it on by slipping the harness over their heads or making them step onto it and onto the holes designed to be slipped into his arms. You can easily do this by training your dog to stand still so as to not get the harness ties mixed up. Just like with babies, you can do this by putting one paw of his one at a time. All these products belong to the top, but I choose Chai’s Choice Best Front Range Dog Harness as the main winner for this roundup. First of all, they allow for maximum security. The lesses can be adhered to either the front or the back. It also has four adjustable spots. Moreover, this product also ensured maximum comfort for your dog. The Chai’s Choice no pull harness is designed with a lightweight mesh lining and a soft padding for the chest. It also comes with a reflective binding that allows for good visibility during the nighttime.